Creating stone tools is a reductive process called “chaîne opératoire” where a knapper, an individual skilled in lithic reduction, forms a rock into smaller, sharp tools by chipping away until the desired shape is achieved. 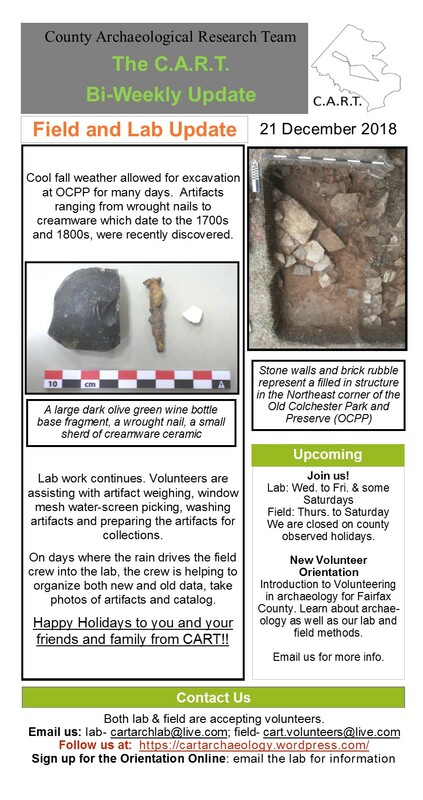 In the field and lab, archaeologists encounter both the stone tools and the fragments of stone that have been knocked off during manufacture. Click here to learn more about lithic production. 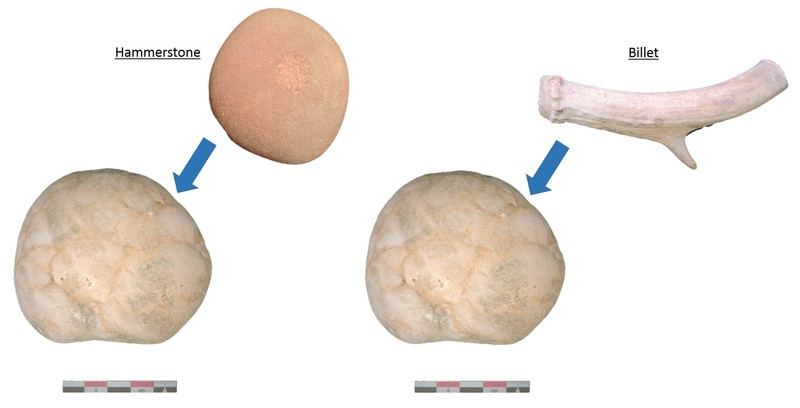 Archaeologists can interpret broken stone as either the result of cultural or natural forces. Natural fracturing of lithic materials from forces such as freezing and thawing (cryoturbation) can be separated from purposefully fractured stone on the basis of morphological attributes associated with flint knapping. High quality materials such as chert, jasper, and chalcedony retain these attributes in the lithic debitage, the rock debris from the manufacture of stone tools. A type of debitage is called a lithic flake and takes a trained eye to distinguish from other stone fragments. A lithic flake is “a thin flat asymmetrical piece of flint or other stone which was intentionally removed from a tool or projectile core during the process of manufacture or sharpening/resharpening” (Gumbus 2019). Flakes exhibit unique characteristics that are the direct result of the processes used when making a stone tool. 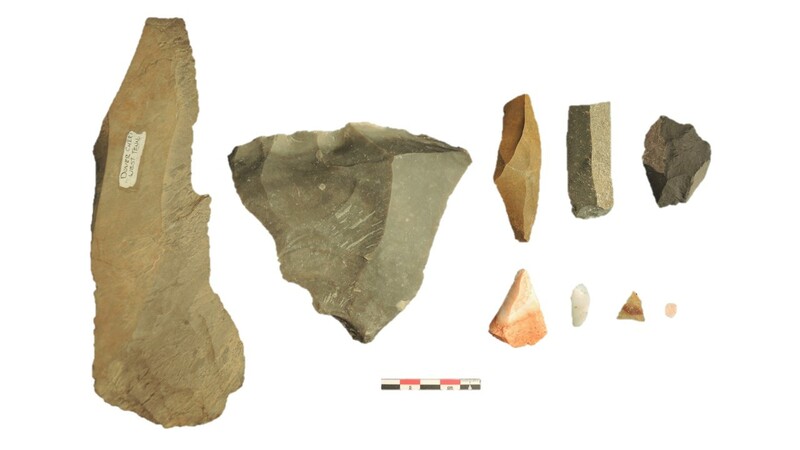 Archaeologists use three main attributes to classify flakes from naturally fractured stone: the striking platform, the bulb of percussion, and what is sometimes referred to as ripples or waves. Typically flakes are relatively thin with a slight curvature and three sharp edges that feather out. The fourth edge is the striking platform. This is where blunt force was used to hit the rock and separate the flake from it. A harder rock or sturdy piece of antler could be used to achieve this. The pressure during impact produces a Hertzian cone that forms the bulb of percussion, a swelling or “bulb” along the inner or ventral side below the striking platform. This force also produces a negative scar on the surface of the rock where the flake was removed. The last attribute, is the ripples or waves that radiate away from the point of impact on the ventral surface. The ripples are a result of the shock wave that runs through the stone when it is struck. 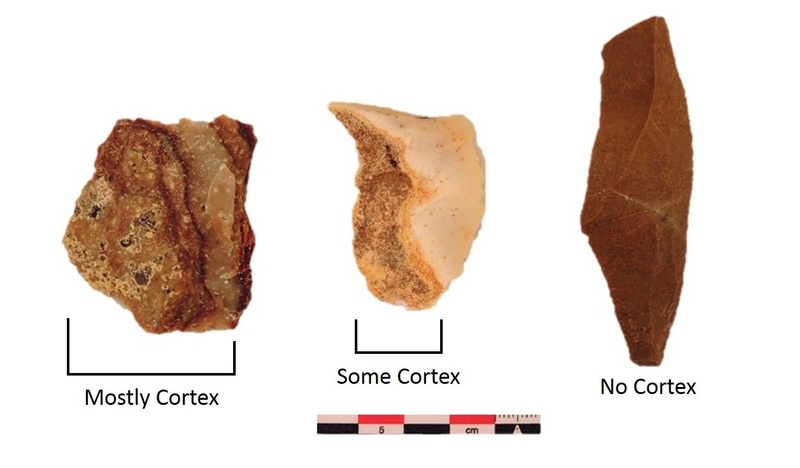 Studying the amount of cortex and number of negative flake scars on the outer surface of a flake can help determine how far along the knapper would have been in shaping a tool. When a rock is selected to be shaped into a tool, it can show weathering from exposure to the elements in its natural setting. The outer portion, called the cortex, can be visible on flakes removed from rocks subjected to weathering. “The first flake removed from a piece of raw material, which will preserve cortex on its entire exterior surface, is called a cortical or primary flake . . . As further flakes are removed from the core they will show diminishing, though variable, amounts of cortex on their exterior surfaces because their exterior surfaces will be partially or completely composed of previous flake scares. These are often called secondary flakes” (Debénath and Dibble 1994). Some rocks are retrieved from quarries or outcrops and will not have evidence of weathering on its exterior so negative flake scars can help determine at which stage of reduction the knapper removed the flake. Fewer flake scars on the external surface would indicate that the flake was removed earlier in the process while many flake scars occur as the knapper further shapes the tool. Flakes can appear in various sizes depending on what stone resources are available and the knapper’s intentions for the tool. Partly, this occurs because different rocks fracture in different ways. Additionally, the intended size of the finished tool will result in larger or smaller flakes. If the knapper is making a large hand axe or cutting tool, then they may choose a large piece of raw material to begin with and large flakes would be removed during the process of making the tool. Alternatively, smaller tools will begin with a smaller rock that results in smaller flakes chipped away during manufacture. Debénath, A. and Dibble, H. L. 1994 Handbook of Paleolithic Typology. Vol. I. University Museum, University of Pennsylvania, Philadelphia. Gumbus, A. 2009 Lithics-Net’s Glossary of Lithics Terminology. Web Page, http://www.lithicsnet.com/glossary.html, accessed January 16, 2019. 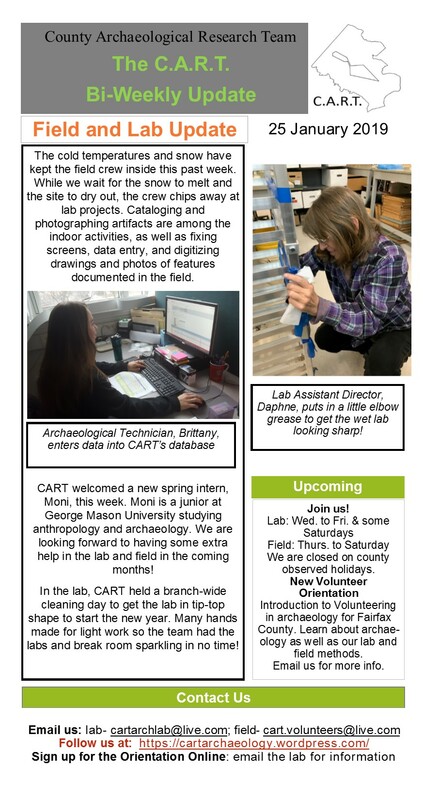 Koons, S. 2015 CART Lithic Analysis 101: An Introduction to Cataloging Lithic Artifacts. 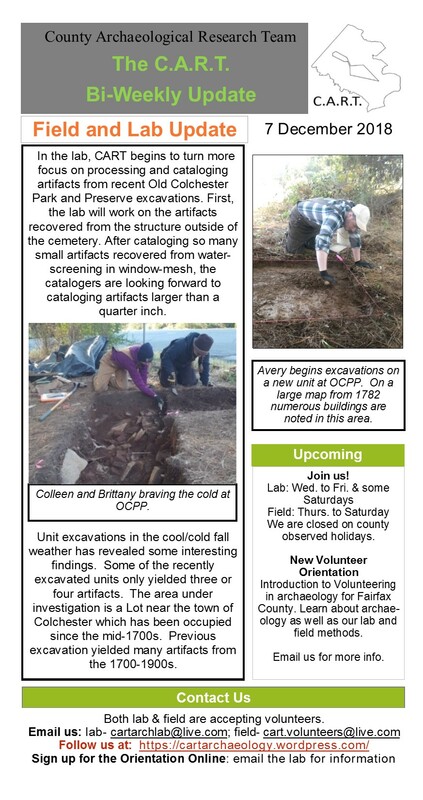 Video, Archaeology and Collections Branch Fairfax County Park Authority files, accessed January 16, 2019. We hope you had a wonderful holiday! 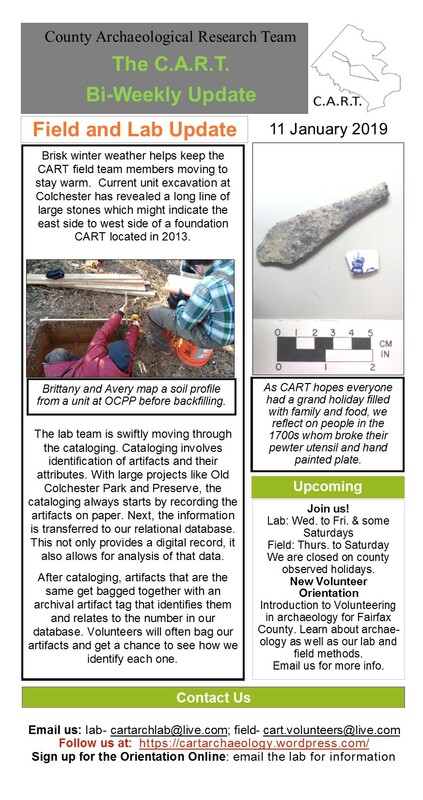 It seems fitting that at Old Colchester Park and Preserve, we have found a few fragments of the base of stemware. Pictured below, the folded base rims date to about 1680 to 1750 (MAC Lab 2018). 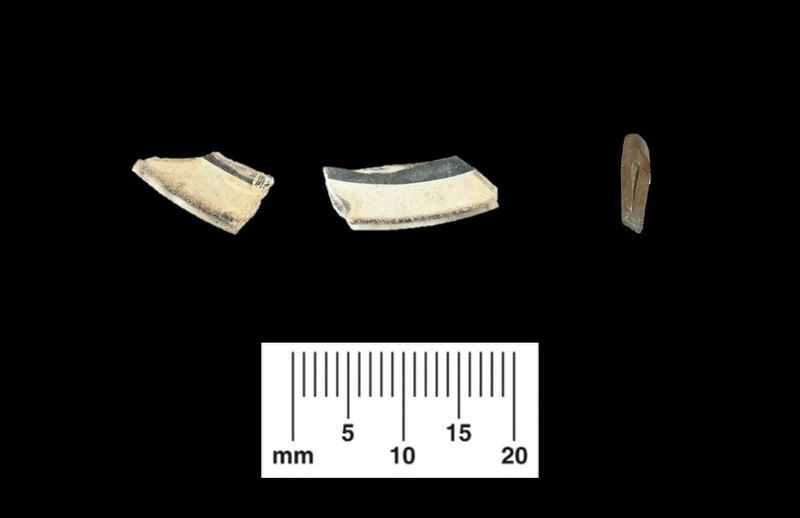 Fragments of the folded rim base of a stemmed glass. Hand-blown glass bottles have a variety of different styles depending on the intended use of the bottle, and when it was made. 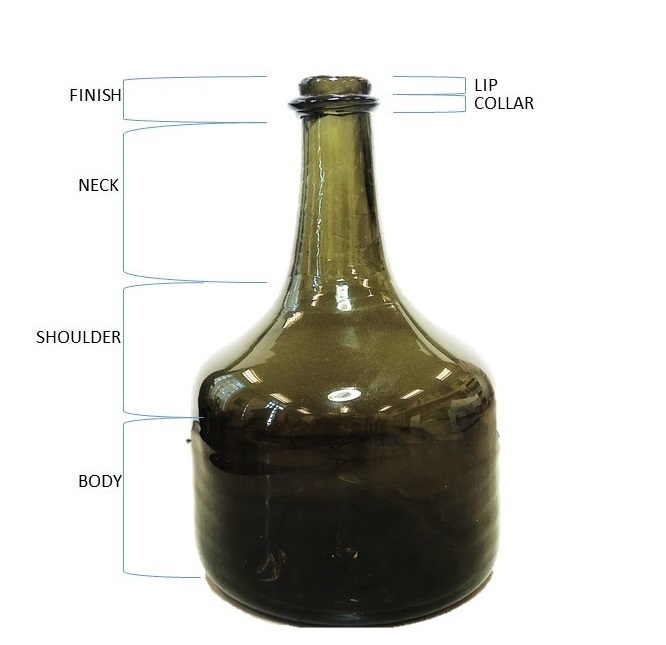 A bottle finish is a term used to describe the parts of a bottle that are above the neck including the lip and collar. The word “finish” refers to the idea that the lip and collar of the bottle, being the upper and lower portions of the finish, were the final steps in finishing the bottle making process. Some bottle finish techniques include the more crude examples like the “cracking-off” where the glassmaker uses a wet or cold piece of iron to cool the glass off in the area where they wish to remove it from the blow pipe used to shape the bottle. This creates a rough edge that could be fire polished to smooth out any sharp edges. “Bursting off” produces a similar rough finish but the glassmaker would blow a large bubble into the glass at the desired breaking point to then burst and shape the lip. Other types of finishes include the “rolled” and “flared”, both of these types involve reheating the end of the neck and manipulating the hot glass with a tool to create a lip. The “laid-on ring” finish also involves reheating the glass to add a band of glass to the very edge of the neck giving it extra reinforcement, but is not refined to make it a clean edge. Applied finishes were adapted from the “laid-on ring” technique, and were one of the common types of finish on American made bottles in the nineteenth century. A thick strip of glass was added to the point where the blowpipe was removed at the end of the neck. The glass was then manipulated with a “finishing tool”, also sometimes called a lipping or rounding tool, to create many different styles of finishes depending on the bottle. The shaping of the added glass using a variety of tools is what separates this type of finish from the “laid-on ring” method. One last category of bottle finish is called a “tooled finish”, the bottle is shaped from a single piece of glass, not added in a separate hand application. The glassmaker would use a variety of shaping tools to create the desired shape by repeatedly heating the neck of the bottle and without adding any extra glass. These methods of creating hand blown bottle finishes changed as America moved into the twentieth century and machine made bottles became cheaper and easier to produce. Bottle finishes also changed throughout the years allowing archaeologists to better understand and date the artifacts they find, since glass can be one of the most difficult artifacts to date without markers. For more information on bottles you can read one of our articles: Case Bottles, Glass Bottle Pontil Scarring, or Pattern Molded Bottle Glass. Lindsey, Bill. Bottle Finishes (aka “Lips”) & Closures. BLM/SHA Historic Glass Bottle Identification & Information Website. https://sha.org/bottle/finishes.htm Accessed 19 May 2018. Lindsey, Bill. 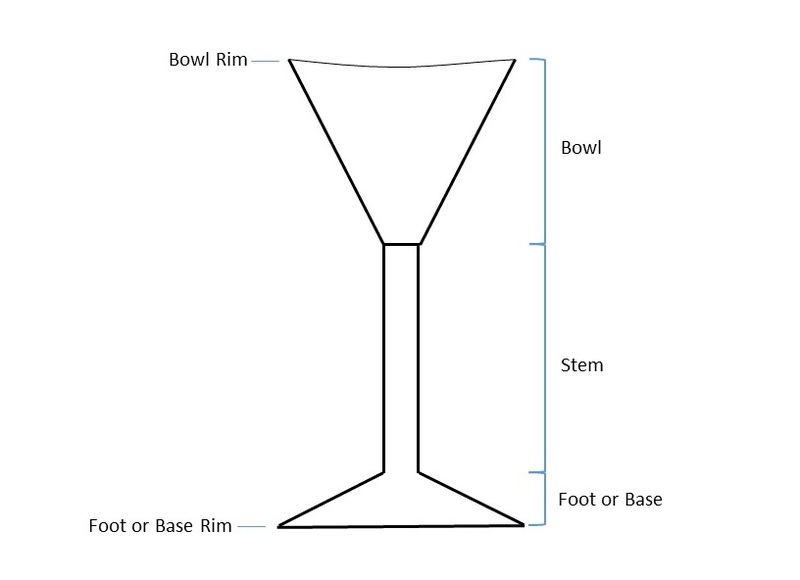 Bottle Glossary: General Bottle Morphology. BLM/SHA Historic Glass Bottle Identification & Information Website. https://sha.org/bottle/morphology.htm Accessed 19 May 2018. Corning Museum of Glass. Glass In America, 2002. Website https://www.cmog.org/collection/galleries/glass-in-america Accessed 19 May 2018.